In The Structure of Scientific Revolutions Thomas Kuhn argued that the history of science is a messy business, involving imaginative leaps, dead ends, and competition, rather than the smooth process of observation and theorising it is often taken to be. Kuhn himself likened the development of scientific ideas to Darwin’s theory of natural selection and it is this Nineteenth Century paradigm shift and the consequent conceptual instability surrounding evolution that is the subject of The Evolution of Inanimate Objects which has been longlisted for the Wellcome Trust Book Prize 2012. Harry Karlinsky’s fascinating novel is both a reflection on inheritance and an attempt to probe the dynamic at the boundary between reason and irrationality in a time when established scientific paradigms were breaking down and Darwin seemed amidst the chaos to reveal a world of possibilities in other domains. As the title suggests, the novel consists of the fictional biography and works of Charles and Emma Darwin’s youngest and non-existent child Thomas, the correspondence between his family and Richard M. Bucke, the Superintendent of the London (Ontario) Asylum for the Insane whose diary details the last troubled months of the young man’s life. Karlinsky’s writing emulates, footnotes and all, the sedulous tone and structure of a biographer: Preface, Life, Works, Illness, Epilogue. The careful and hedged academic argument with the occasional gentle moment of whimsy will be all too familiar to those of us who read such things frequently. For example, one footnote in the biography appropriates the ‘Hurrah, hurrah!’ of Darwin correspondence. Such details would render the novel merely charming, however, were it not for the theoretical heart of Thomas’ endeavours. The most interesting aspects of the novel are the fabricated essays and letters of Thomas and those around him. Karlinsky’s deep knowledge of Darwin’s life and work allow him to construct and appropriate theoretical and biographical details in order to render Thomas’ ‘unusual interest in eating utensils’ plausible. Thomas’ research culminates in his bizarre submission to Nature: ‘Hybrid Artefacts and Their Role in Our Understanding of the Evolution of Inanimate Objects’ but before that are his trips to Sheffield to acquire all sorts of obscure cutlery and papers read before the Plinian Society in Cambridge. In ‘Artefacts and the Origin of Their Rudimentary Characters: By Means of Competition Between Species’ Thomas details how artefact features may fall into disuse and become rudimentary (consider the human appendix). …the table knife and table fork have evolved in form due to their competition with one another. The table knife, originally serving two purposes, has had its pointed tip become much reduced due to competition with the table fork; yet the table knife’s cutting edge remains perfectly efficient. We may conclude that competition between species can contribute to the existence of characters in a rudimentary condition. A less well-received paper ‘On the Effects of the Increased Use of a Character in a Domestic Eating Utensil’ follows wherein Thomas focuses on the development of the lower tine of a pastry fork. One observer describes it in his diary as ‘[Darwin’s] magically expanding fork fiasco.’ Throughout Karlinsky’s occupation of the mind and tone of his writers is faultless. Indeed, Karlinsky’s writing successfully performs the shift of forms of language and conceptual frameworks appropriate to certain contexts in precisely the way that Thomas’ thought does not. Language is vitally important in this novel because it can obscure and reveal so much: contrast, for example, the bland reports of the Plinian Society, which give no hint of the ‘brouhaha’ in response to Thomas’ papers. Karlinsky is a psychiatrist and Professor at the University of British Columbia and Thomas’ instability is well-handled throughout, from his early shyness and preference for solitude, to the obsessive, manic acquisition of cutlery and his apparently threatening behaviour when challenged on his views in Canada. The first hint of Thomas’ odd approach to ‘hybrid artefacts’ and reproduction by mechanical fusion is his covering letter to the editor of Nature. He includes among the illustrations an Oyster Fork-Spoon, whose dual function is presented as a result of non-human reproduction: ‘I apologize for the salacious nature of the latter but this rare depiction of mechanical fusion in flagrante delicto warrants its inclusion, despite the explicit lewdness.’ The manuscript itself is a mixture of failed observation and theoretical intransigence. Its poor reception apparently occasions Thomas’ breakdown and flight to Canada, where he falls into Bucke’s charge and eventually succumbs to TB. It is not generally recognized that artefacts are capable of self-propagation. However, in the process of spontaneous mechanical fusion, two distinct artefacts are, as it were, combined. The hybrid offspring of these spontaneous acts of fusion, I have come to realize, are the most important source of novelty in the artefact world. The mixing of the characteristics of both progenitors produces an abundant supply of variation in every generation. Of course, our response – and that of the editor and Charles Darwin – to Thomas’ odd theory is very similar to that of many to his father’s theories and reflects the nature of discovery and the redrawing of conceptual frameworks. The deeper correspondence is that between Darwin’s concept of the combination of inheritance and variation in the production of new organisms and Thomas’ inheritance of his family’s tendency toward mental illness, his father’s discipline and scientific aptitude. Thomas’ problem is that he has the tenacity (‘your independent mind and your determination to make a contribution in the field of science’) which his father needed, and which is urged on the son as one of the keys to scientific innovation, but, at some point, he moves from sound to unsound and irrational beliefs (and a curious obsession with pastry). Richard Weihe’s Sea of Ink (which I reviewed here) addressed the relationship between madness and creativity in the artist. Like Thomas, the artist Bada Shanren sought solitude in order to develop and practise his art. Shanren’s greatness, however, is unquestioned despite his (apparent) madness, which prompts interesting questions as to the relationship between artistic and scientific genius. The porosity of the boundary between creativity and madness challenges the naïve view of the scientific method as a smooth progression from observation, to theorising and hypothesis and experimentation. Karlinsky’s novel pushes the evolutionary analogy to its extreme in order to reflect on the domains in which such an analogy might be valid. Indeed, his fictional biographer quotes Ernest Nagel: ‘[It] is in line with the normal strategy of the natural sciences to extend the use of ideas fruitful in one set of inquiries into related domains.’ Bucke’s attempt to appropriate the evolutionary analogy for the development of human moral psychology in Man’s Moral Nature (which is a real work) demonstrates the array of uses to which Darwin’s fundamental insight have been put – some more legitimate than others. Which brings us back to Kuhn and his reflexive use of the evolutionary analogy to speak of scientific ideas themselves. 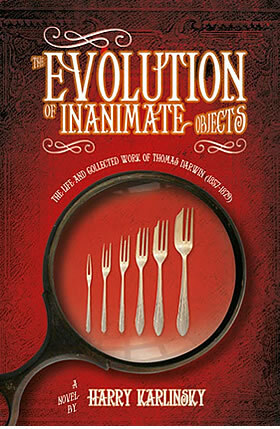 The Evolution of Inanimate Objects is a rich and impressive novel, reflecting its subject matter in its aggregation and presentation of a huge range of real and fictional data to create the impression of a life and work, and in doing so it forces us to consider the nature of scientific innovation, empirical methodology, inference from premise to conclusion, and the character of genius. Full of gentle humour and sophisticated consideration of the fluidity of language which results from paradigm change, this is a genuinely innovative novel. The Evolution of Inanimate Objects is out now from The Friday Project and the Wellcome Prize Shortlist is announced on 11th October. My thanks to The Friday Project for this review copy. This entry was posted in Fiction, Reviews and tagged book review, Books, Charles Darwin, creativity, Fiction, Harry Karlinksy, literature, madness, science, structure of scientific revolutions, The Friday Project, theory of natural selection, Thomas Kuhn, Wellcome Trust Book Prize 2012 by wordsofmercury. Bookmark the permalink.